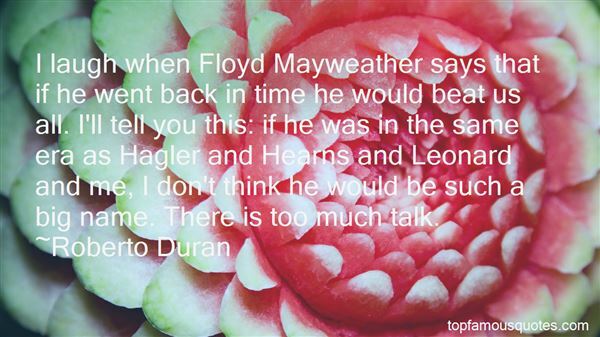 Reading and share top 6 famous quotes and sayings about Mayweather And Pacquiao by famous authors and people. Browse top 6 famous quotes and sayings about Mayweather And Pacquiao by most favorite authors. 1. "Hopefully in 2011 the fans will get to see some fights that they want to see. 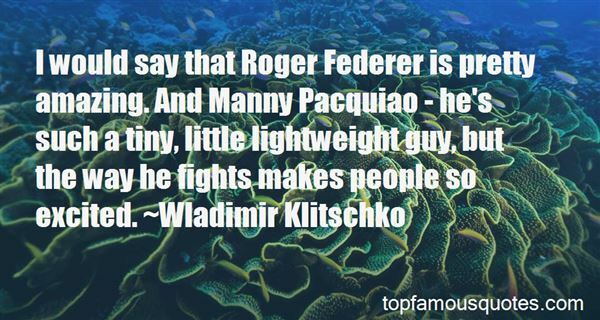 Manny Pacquiao Vs. Floyd Mayweather needs to happen, and so does David Haye Vs. Wladimir Klitschko. The fans deserve to see fights that they want to see and not just the fights that the promoters want to see." 2. "Most people should be talking about how Floyd Mayweather is a great undefeated future Hall of Famer that's his own promoter and that works extremely hard to get to where he's at. Instead, all you hear is hate and jealous remarks from critics who criticize me and, you know, most of the time, the people that criticize me can't do what I can do." 3. "Sa larangan ng sports, may panalo at may talo," Pacquiao said. "Dapat handa ka rin na tanggapin kapag dumating na ang panahon na talo." 4. "I laugh when Floyd Mayweather says that if he went back in time he would beat us all. I'll tell you this: if he was in the same era as Hagler and Hearns and Leonard and me, I don't think he would be such a big name. There is too much talk." 5. "Right now, it's very difficult to single out one fighter, pound-for-pound, who is the best. Right now, it's very complex. Miguel Cotto, Mayweather and Zab Judah's a good fighter as well." 6. "I would say that Roger Federer is pretty amazing. And Manny Pacquiao - he's such a tiny, little lightweight guy, but the way he fights makes people so excited."